I store a vast amount of data from scattered documents to large musical projects and an ever-expanding music, audio and movie library. I’m not one for cloud storage preferring to keep my data local – and even if I were there are few, if any, cloud plans that could support such a large amount of data. 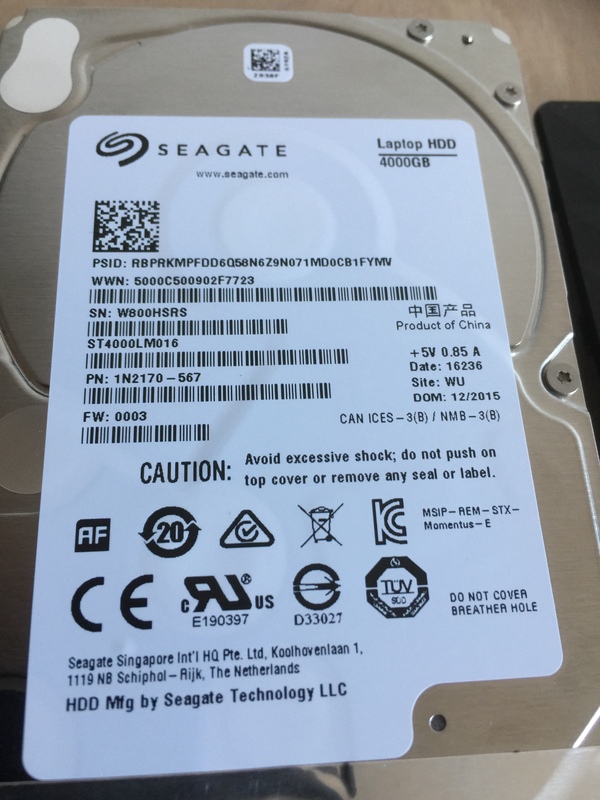 Since switching to a laptop as my primary computer in 2014 I had been using a RAID enclosure with a pair of 2TB Western Digital hard drives, separately configured for time machine backup and file storage. As free space rapidly reduced, and the drives neared the end of their service life (both having traveled between multiple PCs), a new storage solution was in order. I wanted to keep the same drive format, but ditched the enclosure for a pair of portable hard drives that could run from the USB bus, independent of a power source, and could travel on the go. The drives I ultimately settled on were Seagate’s ‘Expansions’ four terabyte models, as I had no need for the extra features of the Backup Plus model. At this point I should state that I’ve had terrible luck with Seagate drives in the past with an 80% failure rate, and the single drive I know of that is still functional being thoroughly worn out after minimal use in a rarely used PC. However Western Digital, with whom I still have a 100% success rate with zero drive failures didn’t offer a 4TB option in a portable form factor at the time, and they couldn’t be that bad, right? The Seagate drives arrived with minimal packaging, documentation and a short USB 3.0 cable, all perfect so far. Once connected they were swiftly reformatted in the JHFS+ (Mac OS Extended, Journaled) filesystem and, data transferred, were brought into service and the RAID setup retired. They ran well for three months, until the first click of death occurred. It was from drive number 2 – the backup drive – and lasted a few seconds before the drive recovered itself and began to function normally. Over the next few months the issue would randomly occur again and again on the same drive but the drive would recover, though I did notice that the sound of the heads on both drives was becoming louder and louder by the day. Oddly enough the Backup drive seemed to recover from its nine month stint of temporary head crashing, and ran normally for quite a while albeit with a considerable amount of rattling on the hour as Time Machine did its thing. The drives continued to function until last week, when the Files drive made the same click of death, as if the heads were sticking. Only it did not recover. Not until subjected to a bit of vigorous shaking, an act that should never be performed on any mechanical hard drive but which, miraculously, awoke this one from the dead. And so it has continued – an almost daily process of click, shake and restore, after which the drive functions perfectly with no issues what-so-ever. At this point, I should mention that the retailer from whom the drives were purchased (who shall remain unnamed) has refused to honour the guarantee, claiming “excessive use” which is untrue. And regardless, I am not comfortable returning the failing drives to a retailer as they contain all kinds of sensitive data which I would need to erase, and writing zeros to a four terabyte disc would take some considerable time and is a process that, frankly, I’m not sure these drives would survive. Data protection should be taken into account when warranting hard drives against defects, but is sadly overlooked. This does however give us the opportunity to perform a teardown, and see what exactly is inside one of these drives. I was particularly interested to know whether these drives featured a standard notebook drive inside, or whether the USB controller was part of the drive’s PCB. Opting for the files drive, the flimsy casework was parted, a flat-bladed screwdriver inserted and the disassembly began. If you’re disassembling one of these yourself, going in at the end furthest from the USB plug will make your job a whole lot easier. Popping the bottom off did indeed reveal a 2.5” notebook drive as I had expected. It’s mounted in the case with four screws covered by rubber covers to reduce vibration. The USB control board is mounted to 1 end of the drive itself, covered by a shield which can be pealed back to remove the board. This exposes what is indeed a standard SATA connector, meaning that these drives are in fact nothing more than regular drives with added USB functionality. This is a major plus, and is something I wish more portable drive manufacturers would continue to adopt as the USB controller board and the USB socket itself are usually the most common points of failure. The drive is a Seagate ST4000LM016. Spinning at 5400RPM with a 128MB cache buffer it is a pretty quick drive, though its capacity requires more platters and thus it measures in at 15MM thick, twice as thick as some notebook drives. You can purchase this exact drive on its own, but it’s actually significantly cheaper to purchase the external model and extract the drive from the case. I couldn’t find any specifications on the SATA interface board (NA82Q0WE). Same problem, purchased in October 2016, warranty until October 2019 but does not work due to the USB controller. By connecting the HD directly the disc works perfectly. I will renounce to the guarantee, because I am being asked to completely replace the HD. Unfortunate solution as I would have to recover the data with high cost or give up all my data … what would you do?